March marks Kidney Month in Canada, and we’re celebrating 11-year-old Gabriel Lalonde, who was diagnosed with atypical Hemolytic Uremic Syndrome (aHUS) in May 2011. aHUS is an ultra-rare condition found in about 1 in one million births, and is a life-threatening, chronic genetic disease that can damage the body’s vital organs. aHUS is caused by changes or mutations to the genes that produce proteins that control part of the body’s complement system called the alternative pathway. Despite the potential for damage to many of the body’s organs, most often, aHUS targets the kidneys. “I think it’s really tough, I didn’t know what it was the first time I heard of it and was kind of freaking out. Since I have my new treatment I feel less stressed and I know the Children's Hospital takes care of me,” he says. Gabriel’s diagnosis came after his parents took him to his pediatrician after he was experiencing bouts of vomiting and she noticed a lot of blood in his urine. The pediatrician recommended they head to the Montreal Children’s Hospital (MCH), where pediatric nephrologist, Dr. Martin Bitzan was able to diagnose Gabriel with Atypical HUS within just 12 hours. What followed was a flurry of consults and information. He was hospitalized for a period of over two weeks, during which he underwent 9 rounds of plasmapheresis (or plasma exchanges). This procedure involves withdrawing blood from the patient so that damaged plasma can be removed from the blood and replaced with donor plasma. The blood, with all its red and white blood cells, is then transfused back into the patient. 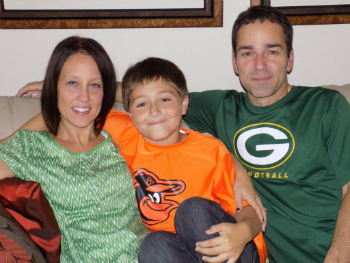 Through genetic testing, Nancy, Gabriel’s mother, learned she was the carrier of the Factor H gene that is linked with her son’s illness. In fact, Nancy’s mother, who also underwent genetic testing, discovered she is also a carrier. In her case, she has lupus, a chronic, autoimmune disease that can damage any part of the body including the skin, joints, and/or internal organs. “In Gabriel’s case, it's the genetic mutation that led up to him getting aHUS and the condition causes his kidneys to struggle to do their job,” says Nancy. “One of the signs that atypical HUS is “active” in a patient is the presence of blood in the urine along with abdominal pains,” explains Nancy. On Easter Sunday this past year, she saw her son’s blood level in his urine was too high and called the Montreal Children’s Hospital who suggested running some tests. It was discovered his aHUS was active again, and he was placed on a new treatment called Eculizumab (brand name: Soliris), which protects blood cells against immune destruction. Every two weeks Gabriel receives a Soliris infusion intravenously by a nurse who comes to give it to him at his home. The family happily reports that Gabriel is doing well on this new treatment. Dr. Bitzan now sees Gabriel every three to four months for regular check-ups. In July 2014, the family received good news after Gabriel’s kidney biopsy: the treatment was keeping the disease inactive.